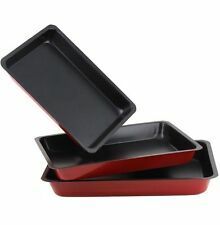 Set Of 4 Rectangular Bright-coloured Small Oven To Table Lasagne/ Pie/ Casserole/ Tapas/ Baking Dish (5x 10x 12cm). These Mini Stoneware Baking Dishes can be taken straight from the oven to the table. 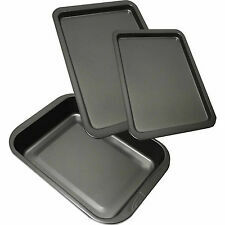 3 PIECE LARGE NON STICK OVEN BAKING & ROASTING PAN DISH ROAST TIN AND TRAYS SET. The trays are suitable for use in microwaves, freezers and ovens. 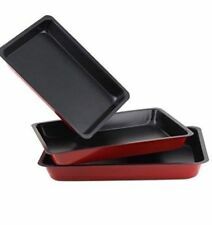 3pc Baking Tray Set/ Dish Roast Set/ Roasting Tray Set. Roasting pan with lid. 33 cm x 24 cm x 5.5 cm. Oval shape. This baking sheet and cooling rack set, is made of high quality pure stainless steel without toxic coating or chemical materials, bringing you a healthier cooking experience. The surfaces the baking pan is smooth for easily releasing the food and cleaning. 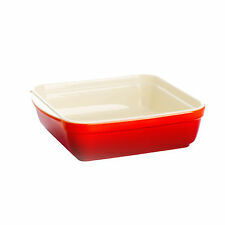 Pyrex Borosilicate Glass Dish Rectangular Roaster with Easy Grip Handles, 30x19. 30 x 19 x 6cm (deep) Please read the instructions before using. This high quality Beer Can Roaster is made from food grade stainless steel, comprising a canister with perforated lid and drip tray. Chicken Roaster with Drip Pan. High quality, stable roaster. Great and healthy way to roast chicken and turkey. Condition is Used. It is oval in shape. These Stoneware Baking Dishes can be taken straight from the oven to the table, safe up to 200C, they are also microwave and dishwasher safe. 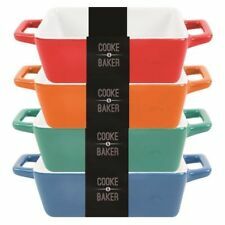 This set of 4 bright coloured ceramic oven to table dishes are going to add colour to your food & table. Set of 3 Roasting Tins With Racks. Carbon steel with non-stick coating. Three sizes. 12 Muffin Pan 35x26x3cm. 6 Muffin Pan 26.5x17.5x3cm. Loaf Pan 25x13x6.2cm. 8pc non stick. Here you?ll find the latest and greatest products. In other words ?. When you order from us, you?ll always get a great product at a great price. The Classic Kitchen ovenware range was inspired by the sculleries of mid-19th century manor houses. Oven, microwave, dishwasher and freezer safe. Mason Cash Oven Dish. Church Gresley was located close to all the raw material and fuel sources required to make ceramics and had fantastic transport links to take finished goods all over the UK and the world. Removable v-shaped non-stick rack with integrated handles to remove from roaster. Inner Rack Allows Food to Sit Above the Fat/Juices For Healthier Results. We pride ourselves on the service we provide. 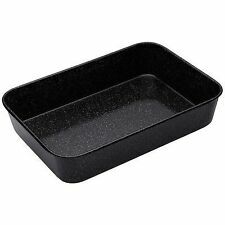 This small rectangular oven dish is safe with all direct heat sources and can be put straight into the dishwasher after use. This will enable us to assist you more thoroughly with your request and to deal with any difficulties. Ultracook Glass Loaf Dish 1.5L with Side Handles. Toughened Glass Oven Dish. Can be used in Oven & Microwave. 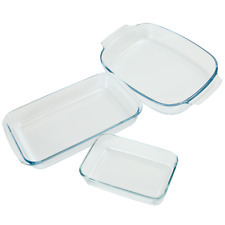 Glass Oven-to-Tableware Rectangular Roasting Dish with handles for ease of use.Manufactured Using Lightweight, Borosilicate Glass. Overall : 26cm x 20.5cm x 3.5cm. Oven, Freezer, & Dishwasher Safe. Raised Centre To Make Juice Removal Easy. BAKING & ROASTING PANS. With side handles & raised, removable roasting rack. Roasting pan non-stick inside and outside. We promise that by choosing us, not only you grab a bargain, but also get fantastic service. Hide Categories. Beauty Products. Lost Parcel. SUITABLE FOR USE IN ALL OVENS. FAST DISPATCH. A GREAT ADDITION TO ANY KITCHEN! These Stoneware Baking Dishes can be taken straight from the oven to the table, safe up to 200C, they are also microwave and dishwasher safe. This set of 4 sharp coloured ceramic oven to table dishes are going to add colour to your food & table. STICK BAKING /ROASTING PAN SET. · Ideal for oven baking / roasting. 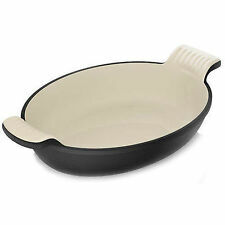 · Non stick for great looking & tasting food. Ending Soon. Need Assistance?. 3 PIECE NON. · Easy to clean. However, we are sorry that we do not take any responsibility for the loss or if we do not find the parcel. CLEARANCE - SWAN Casserole Dishes (2 Set) - !!! HALF PRICE SALE !!! PLEASE NOTE - These products are catalogue returns, they are brand new and unused, however the packaging will not be new, most likely plain boxed with various stickers on, as they have been posted out and returned. The product is still guaranteed. SWAN Round Casserole Dishes (Set of 2) - STONE !!! SALE SALE SALE !!! Price:£49.99 Sale:£14.99 Oven to Table Casserole Dishes - Set Of 2 - Ideal For one or two people Includes lids Oven safe up to 220°C or Gas Mark 7, microwave, freezer and dishwasher safe Dimensions Outer - Width 210mm (inc handles) x Dia 165mm x Depth 100mm (Depth Inc Lid is 120mm) Dimensions Internal - Dia 140mm Depth 80mmCapacity 1.3ltrs Fully guaranteed Free Postage Not for use on direct heat from a gas, halogen. Genuine Handmade Moroccan Traditional Cooking Tagines. Excellent Quality. The trays are suitable for use in micro-ovans, freezers and ovens. 3Pc baking & roasting tray set. Perfect for baking and roasting. The trays are quick and easy to use and the non-stick surface makes for convenient cleaning. Put your cheese round inside the dish and make sure you score or cut the rind, this is a really important step as it prevents your cheese drying out. Place the lid on top of the baking dish. You could also use it to bake eggs or frittatas. Removable v-shaped non-stick rack with integrated handles to remove from roaster. Inner Rack Allows Food to Sit Above the Fat/Juices For Healthier Results. These Mini Stoneware Baking Dishes can be taken straight from the oven to the table. These Mini Stoneware Baking Dishes can be taken straight from the oven to the table. Safe up to 200C, these dishes are also microwave and dishwasher safe. Set of 3 Roasting Tins With Racks. Carbon steel with non-stick coating. Three sizes 31.5 cm x 21.5 cm. Homiu oval Roaster is the perfect addition to your ovenware collection. This heat conducting Roaster is Ideal for use with all standard gas and electric ovens, the roaster and lid are conveniently suitable for oven use up to 230°.